My name is Laura and I'm a grade 10 IB student this year. In my English course, we are currently analyzing poems about love before we write our in-class commentaries. I was wondering if there was any way you could help me analyze my poems more in depth, or if you had any tips for writing a commentary quickly and effectively (as I only have one 75 minute period to get it done). The Nardvark, always eager to help, went straight to Sparknotes, where he promptly got distracted by a clickbait article on the sidebar featuring a picture of pretty actresses wearing cute summer dresses. “Meeting at Night” by Robert Browning. Since you are in grade 10 IB, I assume that means you are not yet in DP but you’re studying the skills you’ll need in DP. Keep in mind that in DP IB, whether you’re studying lang and lit or literature, you’ll get to study a bunch of poems by one poet rather than a bunch of poems with one theme. Your Individual Oral Commentary may be on one of these poems. Meanwhile, it’s important to master the skills of commentary because in literature, your paper 1 exam will give you an unseen poem to write a commentary on, in 1.5 hours at SL or 2 hours at HL. 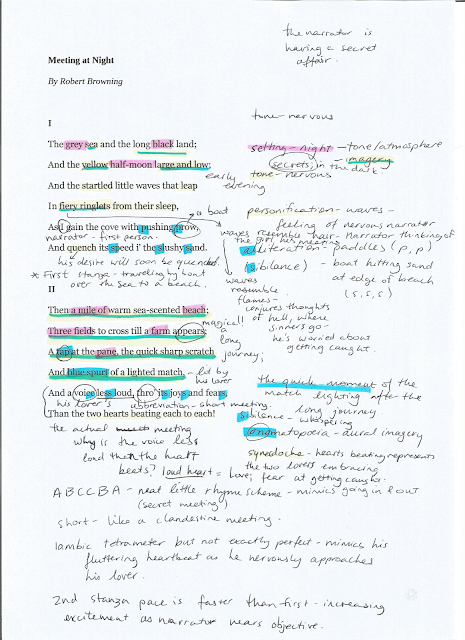 Now, unlike an essay, a commentary does not have to follow a formal structure, but IB does give you a mark for “organization,” so it’s not a good idea to just ramble about the poem. You do need to structure your commentary in some way, and give it a sense of focus and unity. Also, your paragraphs should each be structured around a main point and fully developed. I recommend the PEEL structure to paragraphs. Overall, to give your commentary focus, I recommend starting with an introduction that gives the meaning and message of the poem, and then going through the poem either line by line or by looking at the most effective poetic devices, and showing how each point you make ties in to the poem’s meaning and message. Before we can do that, we need to read through the poem several times. The first time you read a poem, write a little note of your first thoughts or your first reaction up in the top right corner. Then read the poem again and try to get an overall idea of the tone/mood/atmosphere and general meaning. It helps at this point to highlight the words or phrases that establish the mood. By now you should be starting to get a handle on the deeper meaning of the poem, and its message. Write them down. 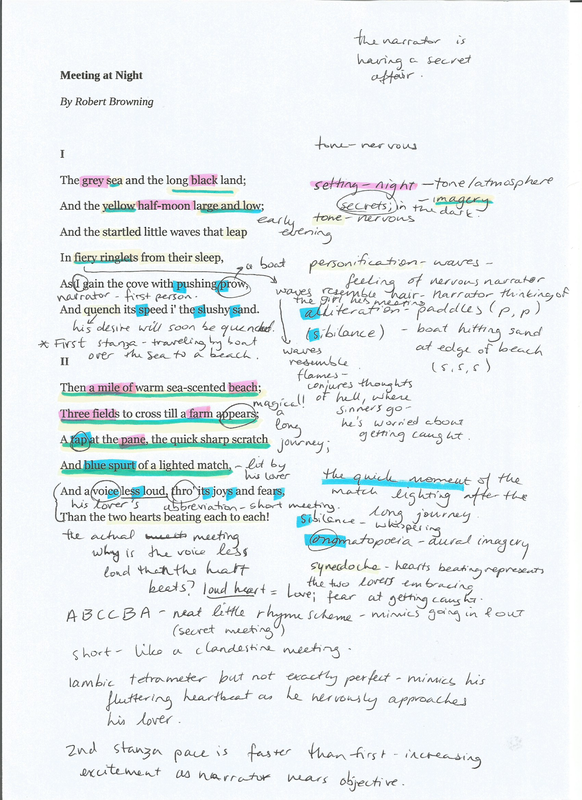 Now read through the poem again, and note down the effect of each of the literary devices you highlighted last time. Also, look for any sort of overall, sweeping devices. For example, some poems are extended metaphors; some use lots of imagery, and some have a lot of sound devices that contribute to their mood or meaning. Now you should plan out your commentary. Some students find it beneficial to start with a mind map showing how each of the devices connect to the meaning or message of the poem. Others prefer to do a linear, outline-style plan. Whatever works for you, do it. Is this really necessary, Nardvark, you might ask? Nardvark doesn’t know; he doesn’t plan anything. That’s why Nardvark is still in grade five and he’s thirty-six years old. But according to Nerdvark, research shows that students who plan their written responses ALWAYS get higher marks. Remember, part of the mark for commentary, either IOC or paper 1, is for organization. Since you, Laura, are studying ten poems, I’d recommend writing a plan out for each one in preparation for your exam. Then at exam time, you’ll be able to sit down and jot down your plan super quickly from memory. That gives you plenty of time to write out your commentary. "Meeting at Night" by Robert Browning annotations -- if you can't quite make it out, try clicking on it for a larger sized image. The poem is about a nighttime meeting between secret lovers. In the first stanza, the narrator is in a boat traveling across the sea and then reaches a cove (a hidden beach) and pulls the boat up onto the sand. In the second stanza, he crosses the beach and three fields, reaches a farm, and signals his lover through the window pane by tapping. She lights a match and welcomes him in a whisper and then they embrace. The tone of the poem is nervous as the narrator is sneaking around at night, clandestinely meeting his lover in a secluded farm house. Some of the words and phrases that add to this secretive tone are: "gray," "black," "half-moon" -- the poem takes place at night, probably just after dusk as the moon is "yellow... large and low." The atmosphere is dark and quiet; he's being very sneaky, and his nervousness is evident through the "startled" waves that "leap" -- this personification gives the nervous feeling of the narrator to his surroundings. The narrator first enters the poem in line five with "As I gain," giving the poem a bit of a first-person narrative effect. It's like the narrator is relaying an experience to the reader. There is some alliteration in line five of the 'p' sound in "pushing prow" which could mimic the sound of the waves hitting the wooden hull of the boat, the paddle dipping into the water, or the nervous narrator's pumping heart. The next line has sibilance in "its speed i' the slushing sand" which could mimic the quiet sound of the little waves lapping the beach and the boat hitting the wet sand at the edge. As the boat hits the shore, its speed is "quenched," as the narrator's desire to be in his lover's arms will soon too be quenched. The pace is a little faster in the second stanza via short words with light vowel sounds: "a mile of warm sea-scented beach" trips off the tongue as the speaker is getting closer to his lover and starts presumably striding quickly across the beach and through the fields. The farm "appears," it seems almost magically, like when you have to go through a lot of work and cross many obstacles and then your goal seems to suddenly be right in front of you. The onomatopoeia of "tap" is a bit of aural imagery; the reader can hear the light sound of the narrator signalling his lover through the window pane. The scratch and blue spurt relay aural and visual imagery of the exact moment the match is lit from within the farm house; as after a long, arduous struggle, sometimes the moment you reach your goal seems very quick. There is sibilance in line 11: "voice less loud, thro' its joys and fears," mimicking the whisper of his lover's greeting and maintaining the quiet, secretive atmosphere of the poem. The last line uses synecdoche -- the hearts, symbols of love, represent the two lovers as they embrace. Their heart beats are louder than the voice of the narrator's lover. This hyperbole enhances the sense of nervousness as the clandestine "meeting" from the title finally takes place. The poem has a unique rhyme scheme: ABCCBA which could mimic the idea of going in and out, as the narrator has to travel so far to meet with his lover and then presumably has to make the same journey in reverse before morning; since the rhyme scheme is repeated, we get the impression that these meetings are repeated. The poem is short, like the short period of time that the lovers get to spend together during their nighttime meetings. The rhythm is more or less iambic tetrameter, which gives the poem a light, fun feel and also mimics the narrator's fluttering heartbeat as he nears his clandestine destination. All over, the rhyme, rhythm, meter, and euphonic sounds of the words combine to make "Meeting at Night" enjoyable to read, enhancing the pleasurable feeling of the narrator as he nears his lover. "Meeting at Night" is not just about the lengths one poet went to to meet his lover for a secret meeting; it is about the lengths we're all willing to go to in order to reach our goals. For this reason, you could say "Meeting at Night" is an extended metaphor, in which the sea, beach, and fields represent obstacles we must tackle as we work towards our goals, the lover represents the goals, and the final embrace in the last line represents the satisfaction we feel when we finally make it. Learn more about perfecting your skills for IB commentary by clicking here.